As a paradigm of found footage cinema in Spain, the Mostra will invite the visual artist María Cañas to participate through a masterclass and an exhibition of the most recent pieces of her work, including her "videoguerrilla" works. Two key authors of this edition will be Aldo Tambellini, one of the parents of the American counterculture of the 60s, and German filmmaker Helga Fanderl. Tambellini will be the protagonist of a complete program curated by Helena Girón and Samuel Delgado, which will include a session of his Black Films, another dedicated to some of the fundamental films exhibited in the Black Gate Theater (both completely in 16mm), in addition to a performance and an installation. The (S8) will exhibit two sessions of Fanderl's work, plus a masterclass in which she will also project some of her works, that can almost be seen as film haikus. 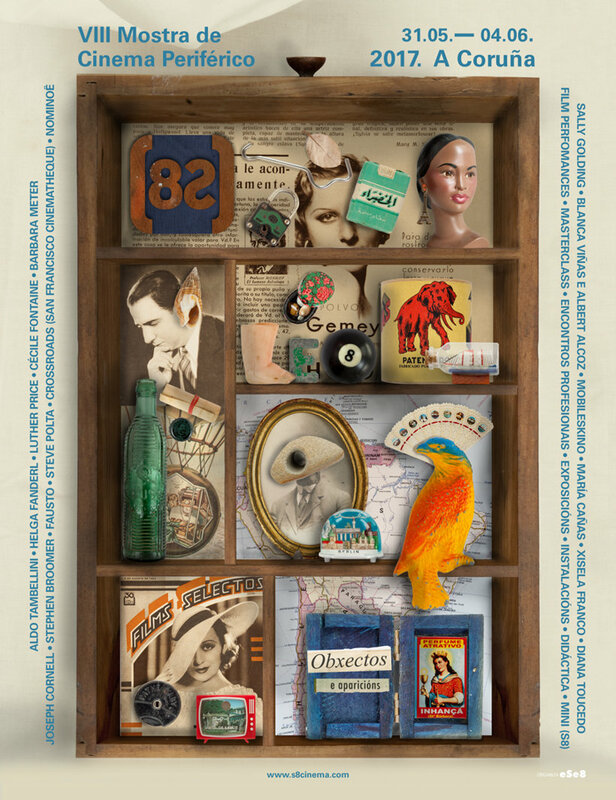 In its quest to show unique and exclusive content, (S8) will premiere the film Potamkin, by Canadian filmmaker Stephen Broomer, and will bring to Spain for the first time the coveted works in super 8 by Steve Polta, cult filmmaker and director of San Francisco Cinematheque's Crossroads Festival, guest festival in this edition. At the same time, in the section dedicated to real-time cinema or film performance, Desbordamientos, there will be shown five indispensable works. The recreation of the performance Moondial, by Aldo Tambellini; Parallax, the spatial and geometric games of the French collective Nominoë; Two of the most recent work by Australian Sally Golding, Light Begets Sound and Ghost - Loud + Strong; And, finally, The Night Invented, performance of the filmmaker and researcher Albert Alcoz and the photographer Blanca Viñas. The section Sinais will gather the best of the Galician avant-garde cinema. On the one hand, with a session dedicated to editor and filmmaker Diana Toucedo and, on the other hand, the selection of Sinais en corto, which this year brings together works by, among others, Carla Andrade, Jaoine Camborda, Helena Girón, Marcos Flórez and Samuel Delgado. The Galician representation will close with Viguese filmmaker Xisela Franco presenting her latest videoinstallation Interior, exterior, durante. Finally, as part of the special activities to celebrate its eighth anniversary, (S8) will also launch an international creation scholarship program for national filmmakers. An open call starting in September, in collaboration with LIFT - Liaison of Independent Filmmakers of Toronto-, through which an audiovisual project will be selected to be developed as part of a residency. In the same way, the festival will publish 8S8, a unique book & DVD, in a limited edition, which will collect texts and unique images of many of the great names that have passed through the Mostra over the years.